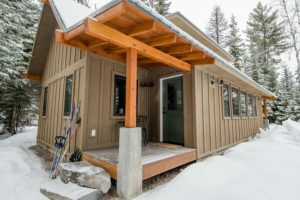 Our newly constructed secluded cabin with private Swan Range views is ready for you. Only three miles to Bigfork Village. Private outdoor space, trails, and solitude await. The perfect place for you to rest your head between adventures. Close to rivers, lakes, and trails. This location gives you all of the Montana privacy you desire with only a short distance to Bigfork’s amenities. The lodge is divided into two separate sides making it ideal for families or groups traveling together. Since this is also the home of our winter dogsled tours, the lodge sides are named after traditional dogsled commands, “Gee” (right) and “Haw” (left). “Gee” side has a queen bed and private bath. “Haw” side has a queen bed on the lower level, with bath as well, and a spiral stair leads up to a semi-private loft with two additional full size beds and a sofa. The center of the lodge is a full kitchen and communal space that works great for gathering. Each side has its own private entrance and covered porch area. Booking the entire lodge is available year-round and allows you to have room for your whole group. 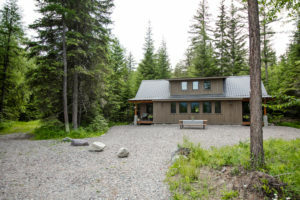 Extended families or groups of friends that all want to be together but enjoy the separation of their own space will love the privacy of this 3 bedroom 2 bath cabin. Amazing views of the Swan Range and a full kitchen. Rates vary seasonally from $220/night in the winter to $350/night in peak summer. Only available to book, separate from the main lodge, September-May. The “Gee” side of the lodge is great for couples who are looking for affordable luxury for the evening. A comfortable queen size bed and private bath, as well as in-room coffee will give you all of the amenities of a hotel room with a wooded Montana setting right out your front door. Sharing the kitchen and communal space with the visitors in the “Haw” side gives you added amenities. Wonderful off-season rates as low as $85/night. The “Haw” side of the lodge is available for those of you who need a slightly larger room for your family or a group of friends. A queen bed on the lower level with adjacent bathroom and a spiral stair takes you to a semi-private loft with two additional full size beds and a sofa. Sharing the kitchen and communal space with the visitors in the “Gee” side gives you added amenities. Off-season rates as low as $125/night. Please book lodging directly through our VRBO and Airbnb pages. Packaging lodging and a guided adventure? If you are coordinating lodging to compliment a guided adventure please make sure to make a reservation for your guided trip prior to booking your lodging. This can be done by calling 406-871-9733.